Let me just say this was the best holiday I've ever had. Fun, exciting, relaxing and romantic. Of course, it was much too short, even though I did wish I could fly to my own bathroom and bed every night! The day before was ominous: I had a bad backache and was in pain that night. Much as I hated to, I seriously considered cancelling the vacation, especially as we were going to drive down. "Let's see how I feel in the morning," I told the Guy. The copious applications of pain-relieving gel and a few hours sleep helped, and I got up in the morning feeling all excited about our vacation. The drive down the highway was beautiful, and smooth. The weather was perfect: cloudy and breezy, so that it was cool and we had the windows down and the AC off for much of the way. We soon found out why the weather was how it was. Our agent from Goa called up to confirm that we were on our way, and informed me that it was raining heavily there. We hoped that the rain would let off by the time we got there, and drove on. We drove past green fields and over rivers. City slicker that I am, I exclaimed, "That looks just like Farmville!" Then we took a turn off the highway, and drove on a small road that went through fields. The road was a little bumpy, but it was so amazingly refreshing, driving past farms and fields. The Guy and I had made sandwiches for the journey, so we didn't even stop for lunch, just munching sandwiches and stopping for tea. 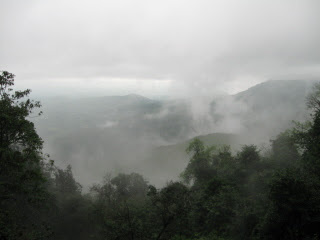 As we turned into the hills, we encountered mist, beautiful swirling clouds. We came across a waterfall, and stopped for tea and to take a few pictures. There were pot-bellied men walking around in their underwear, and I even saw one man taking off his wet underpants under a towel. And I remarked on the double standards that make this acceptable while women are supposed to be dressed modestly and demurely. We encountered some serious mist that slowed our journey down. We could barely see a few feet ahead of the car, and we moved forward slowly and hesitantly. Fortunately, my friend is a terrific driver and we felt safe in her hands. We reached early in the evening to dark skies and rain. We were too tired to go down to the beach, so we just went out for an early dinner. 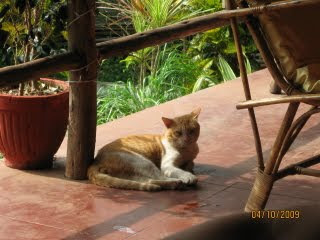 The Guy and I got up the next morning and had a quick breakfast in our hotel before hurrying down to Calungute beach. We spent most of the next day by the beach. 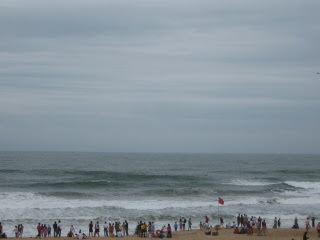 It rained intermittently, and lifeguards went about warning people not to go in, so that all we did was get our feet wet. But the sound, the smell, the sight of the sea was exhilarating. In the afternoon, the four of us went into the water again: we went in deeper than we had been allowed to before. The sand was treacherous, sinking and shifting beneath our feet as the waves receded. The receding tide was strong. As the Guy plunged into a trough, he clutched my hand, and my foot twisted a little. The cold water made it hurt. We went back to our hotel late in the afternoon, talking of naps... But the sight of the pool invigorated us and we quickly showered and changed into our swimsuits. We splashed around until the pool closed. Then it was time to shower and change again and go for dinner. It being Saturday, we went to Tito's. But we were hungry, and it was only 7.30 when we got there. We sipped drinks and ate each course slowly, whiling away the time till it was 10.30 and the real Tito's opened. Between courses, each couple took turns at a walk on the moonlit beach while the other kept the table. By 11, the little lane was crowded with vehicles and pedestrians. There was a small crowd outside the disc. We got in and found a much bigger crowd inside, everyone dancing away, bumping into other people. We joined them. For a time, the Guy and I danced with abandon. But it was too crowded, people kept pushing past us to go in or out, and my foot had begun to hurt again. We decided to get out. It seemed impossible to find our friends in the crowd, so we just walked out and found a cafe on the street where we could sit, sip a drink, and look down on the street. It was 1 am, and the street was crowded. Women in slinky dresses walked by nonchalantly. I thought of how it's nearly impossible to find an open restaurant around midnight in our city, and revelled in the atmosphere. Our friends found us in an hour or so. But the car was hopelessly stuck down the street, and they were determined to wait for it, so the Guy and I started off for the hotel. We walked for nearly a kilometre, past swollen traffic and stuck vehicles, and then we took a taxi home. We lay on our hotel beds and read until we fell asleep. The next morning, we didn't wake up our friends because they had had a late night, so we got up and went for breakfast on our own. It was a late breakfast - we started at 11 - but a very good one. 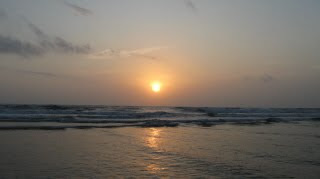 We then took a taxi to Baga beach. The red flags signifying no swimming were still up, so the Guy and I walked along the beach, played with our frisbee, and then settled down in two long beach chairs below an inadequate umbrella. The sun was out, and it quickly grew unpleasantly warm. I finished my book - a delectable Georgette Heyer - and clamoured for lunch. We sat in a restaurant overlooking the sea and had a leisurely late lunch. Our friends joined us there some time later, and then we went back to the hotel. 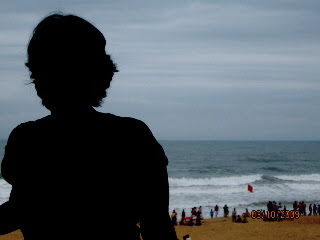 As much as the beautiful beaches of Goa, I love the touristy atmosphere of the place: everyone seems to be on holiday there, even the locals; people are friendly; there is little of the shady-creepiness that I associate with most popular tourist spots in India. Vendors can get annoying, but even that is not too bad. Also, I love how kind they are to animals: stray dogs walk in and out of restaurants; birds pecked food off a newly-vacated table and the waiter barely shrugged when I asked him to clear that table; and cats too walked around looking at home. That may also partly explain why I rarely heard dogs barking or growling there, even though there were many around. Here at home there's a regular midnightly cacophony that we have to close our windows for and never quite succeed in shutting out. Monday was our last day there. By the time we dragged ourselves out of our rooms it was mid-morning and too sunny to go to the beach. We went for another large breakfast, and then decided to go sightseeing. We drove down to Old Goa and saw St. Francis'. But it was hot and humid and we were getting tired, so we decided to go back instead of going to Panjim, as we had planned. We got back to the hotel after a late lunch and decided to go to the beach by sunset. Our friends went off to rest while the Guy and I changed and rushed to the pool. After a pleasant hour, we hurried out so as to be in time for the sunset. We were well in time. 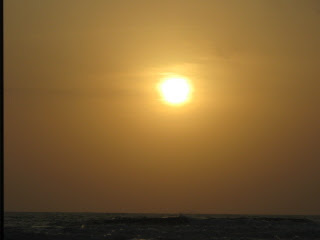 We placed a bedsheet on the sand and lay over it, staring up at the evening sky. I could hear the loud waves twice, once through carried through the air from the sea a few metres away from me, and once through the bed of sand under the sheet. When it grew dark, we settled ourselves into a restaurant so that we could still see and hear the waves. It was our last evening in Goa and we wanted to savour it. We started off early next morning. We met rain and mist on the way again, and broken bumpy roads. 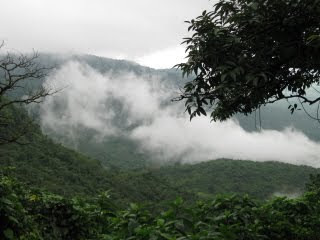 We also drove through the most beautiful sights: mist rising over the hills, green fields all around us. Once, I looked down over the cliff and saw still water, the far side covered with mist so that I could not see where it ended. It looked magical. I thought it was a lake: it was only after we drove by it for some time that I realised it was in fact a river. Then we crossed it, and the magic passed. On our way back, we saw the orange flowers again, only, instead of thousands, there were millions this time. The rains must have brought more out. They reminded me of Wordsworth's daffodils. Unfortunately, I again forgot to take a picture. Maybe I'll persuade the Guy to drive us out there again this weekend, just to take a few pictures. It was our wedding anniversary, that day when we drove back. The entire vacation had been a celebration of our marriage. And look what I got for our anniversary! Interesting post.. Anniversary wishes though belated.. 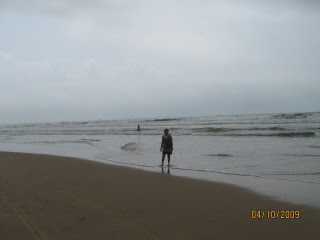 I would love to drive from Mumbai to Goa someday.. your travel account has increased that urge Unmana. Sounds like a lovely, though rainy holiday. The orange cosmos sound pretty. We have them growing here in our yard in the US, but only in small clumps. I've never seen whole fields of them. Invasive species can be so pretty! Happy anniversary. This is your third, if I remember correctly? My gal and I just celebrated our 23rd, by driving up and visiting our youngest daughter in college. Tarabhatt: Thank you. We drove from Pune to Goa, though. Ver: Thanks, it is indeed! Congratulations to you too! I hope the daughter's doing well in college? I'll email you. The pics are delightful and I can imagine how magical those things seemed in reality. I love road trips for just this reason. A few road bumps are totally worth it. 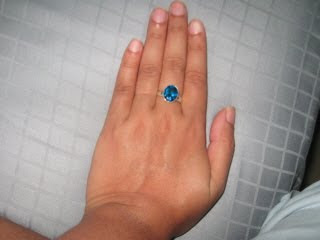 Beautiful ring, on a beautiful hand, after what sounds like a beautiful vacation :). Glad you had such a lovely time! simplypallu: Worth it indeed! We would do it more often if our backs were in better shape - or if we had a nicer car! This was the friend's, much nicer than our old small one. Happy Anniversary! That was a lovely ring. Belated wishes on your anniversary dear. Sounds like a great trip!! Cant wait to have a trip like that. The ring is so damn pretty!! It'll be really different to go there with parents though, nahin? Not necessarily bad or worse than going with friends, just very different. Sarkywoman: Thanks. And it still is, I assure you. NuttyNits: I hope you get your wish soon! 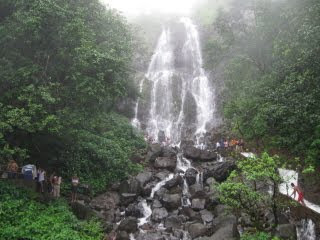 Sumedha: The first time I visited was with my parents and sister, back when I was in college. I enjoyed it then, but it was nothing compared to the fun of going with the Guy. umm... :D ya, that's what I meant.